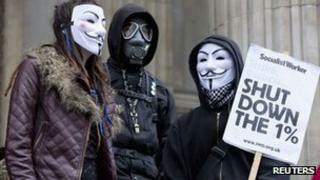 A top Bank of England official has said the Occupy movement has played a key role in financial reformation. Andrew Haldane, executive director of financial stability at the central bank, said Occupy's voice had been "loud and persuasive". He said policymakers had listened to the campaign group, which seeks to reform the financial sector. Mr Haldane told a meeting organised by Occupy in London that protesters had touched a "moral nerve". Occupy protesters first targeted the London Stock Exchange (LSE) on 15 October 2011, following similar protests around the world against growing economic inequality. They set up camp outside St Paul's Cathedral next to the LSE and remained there until February, when they were evicted by the City of London Corporation. The movement gained both supporters and critics. In his speech Mr Haldane gave what many will see as a surprising endorsement to the group. "Occupy has been successful in its efforts to popularise the problems of the global financial system for one very simple reason: they are right," he said in his speech. He went on to say that both Barclays and Lloyds were seeking to change their "sales-oriented culture" and return to their Quaker roots. "There is the quiet, but unmistakable, sound of a leaf being turned," he said. "If I am right and a new leaf is being turned, then Occupy will have played a key role in this fledgling financial reformation. "You have put the arguments. You have helped win the debate. And policymakers, like me, will need your continuing support in delivering that radical change."